128 E Sixth St., Newton. The opening reception will include talks by the artists, music by Barrick Wilson and refreshments. The event is free and open to the public. Throughout history, the four seasons have inspired creative expression in music, literature and art. In “One Season at a Time,” opening Saturday, Sept. 19, 7 p.m., at Carriage Factory Art Gallery, 128 E. Sixth, five area artists will share their visions of the seasons through watercolor, oil, acrylic, photography and glass. The opening reception, with artist talks, music and refreshments, is free and open to the public. The first floor gallery will be the backdrop for the work of Susan Bartel whose art will depict spring, Jeff Heidel, summer, Cher Heller Olson, autumn, and Virgil Penner, winter. 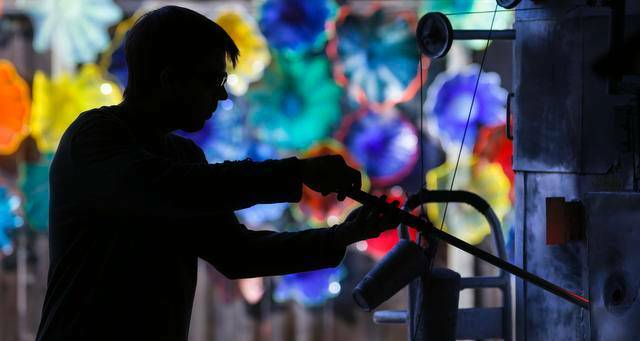 The work of glass artist Scott Garrelts will span all four seasons. Susan Bartel has worked with a variety of media, both as illustrator and fine artist. Her current passion is watercolor. “I love the way one color mixes with another, creating miracles in the interaction between paint, water and paper,” she said. Virgil Penner’s inspiration as an artist was nurtured when he studied under Marie Orr for four years at Newton High School. He became well known for his intricate ink drawings of homes and buildings with an architectural perspective. Since his retirement he has focused on acrylic landscape paintings, uniquely colorful and bright. “I continue to refine my technique with a style not as you would see in reality, but with an air of whimsy,” he said. Jeff Heidel, landscape and wildlife photographer, was born and raised in Newton. His artistic progression began in high school when he was searching for a medium that best suited his talents. He purchased his first 35mm camera during his sophomore year and was soon contributing to the school’s newspaper and yearbook. His passion for photography was rekindled as an adult when he spent time on his grandfather’s farm near Manhattan and experienced the beauty of the Flint Hills. “I wanted to capture the beauty of Kansas — the clouds, prairie grass, sunsets and sunrises. Maxwell Wildlife Refuge and the Flint Hills, especially the area around Matfield Green, are my favorite places to photograph in Kansas,” he said. Heidel currently lives in McPherson. Cher Heller Olson grew up in a small town in Mitchell County, Kan., and has been painting since she was a child.She studied art education at Kansas State University and later taught art in Australia, where she was drawn to the beauty of the open landscape. She currently lives near Council Grove and the Flint Hills Tallgrass Prairie. “I have spent most of my life in Kansas and the prairie has been so inspiring,” she said. She uses impressionistic expressions for her Kansas landscapes. The work of the five artists exhibiting in “One Season at a Time” will be for sale and on display from Sept. 19 through Nov. 7. 12 to 5 p.m., and Saturday, 10 a.m. to 5 p.m.